In mass-production vehicles, the accelerator, brake, and clutch pedals all have the same type of rubber surface. 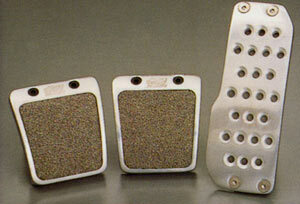 However, in formula machines, only the surfaces of the brake and clutch pedals are made non-slip. This is because in racing where more demanding footwork is required, the accelerator requires exactness, but the brake and clutch require grip. Mugen believes that this also holds true for sports driving, in which nimble footwork is needed. With Mugen sports pedals, the accelerator has a wide front and rear with a buffed surface finish, while the brake and clutch pedals are small pedals with a nickel-chrome blown metal non-slip surface. All the pedals have a cast aluminum base. They are fitted by replacing the original rubber. Five-speed manual or automatic vehicles.